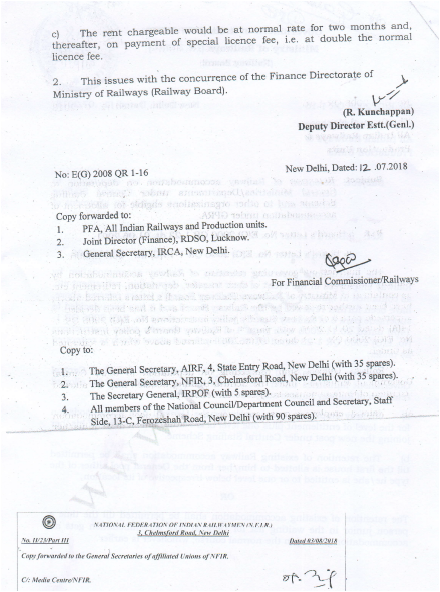 Subject: Retention of Railway accommodation on deputation to Central Ministries/ Departments under Central, Staffing Scheme and to other organizations eligible for allotment of accommodation under GPRA. Ref : i) Board’s Letter No. E(G) 2000 QR 1-23 dt. 01.06.2001.
ii) Board’s Letter No. E(G)2006 QR 1-14(C) dt. 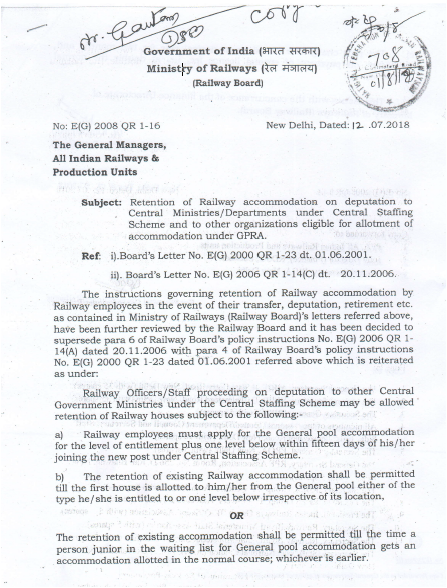 20.11.2006.
a) Railway employees must apply for the General pool accommodation for the level of entitlement plus one level below within fifteen days of his /her joining the new post under Central Staffing Scheme. The retention of existing accommodation shall be permitted till the time a person junior in the waiting list for General pool accommodation gets an accommodation allotted in the normal course; which ever is earlier. c) The rent chargeable wou1d be at normal rate for two months and, thereafter, on payment of Special licence fee, i.e. at double the normal licence fee. 2. This issues with the concurrence of the Finance Directorate of Ministry of Railways (Railway Board).